The Yukon Geological Survey has compiled a comprehensive database of mineral occurrences in the territory. If any of these occurrences occur near geochemical targets, their descriptions can provide the explorer with information relevant to the target assessment. If a MineMatch target incorporated the information from a nearby mineral occurrence, the match results page will indicate the name of the mineral occurrence in the description column to the right. The referenced mineral occurrence can be viewed on the web map by turning on the mineral occurrence layer, and all of the occurrences are hyperlinked to the online YGS Mineral Occurrences Database - greatly improving the speed with which targets close to known mineral occurrences may be evaluated (example shown below). 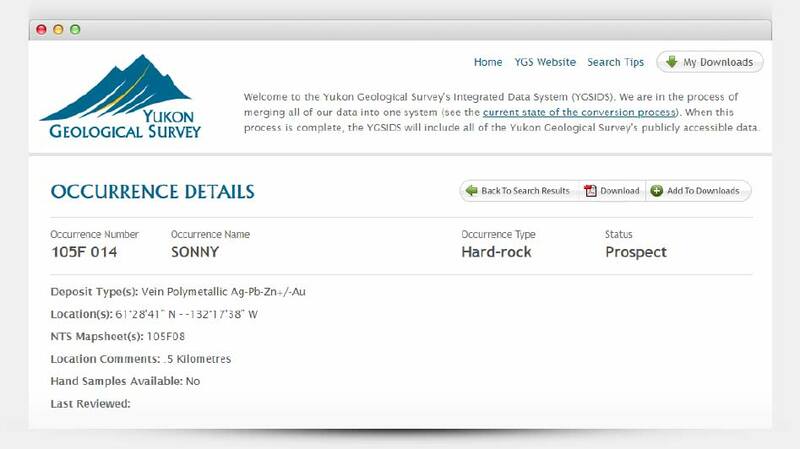 Currently, the information in the downloadable database provided by the YGS does not encompass all of the information provided in the detailed descriptions of each mineral occurrence. Future iterations will incorporate more detailed descriptions from the unstructured text into the MineMatch analysis.